1. Preheat the oven to 180˚C, gas mark 4. Line the base and sides of a 20cm cake tin with baking paper. Finely grind the almonds and pistachios together in a food processor. 2. Put the sugar and nuts in a large bowl and mix well. Add 1 egg at a time, mixing well between each addition. Tip in the flour and mix gently, then pour in the melted butter and stir well to combine. Pour the batter into the lined cake tin and bake for 50–55 minutes, until golden and a skewer inserted into the centre of the cake comes out clean. Cool on a wire rack, then remove from the tin. 3. While the cake is baking, spread the rhubarb over the bottom of an ovenproof dish so it fits snugly in a single layer. Scatter over the vanilla pod, lemon zest and ginger, then strew the sugar over the top. Cover well with foil and bake for 25–30 minutes until tender but not collapsed. Let sit for at least 1 hour before serving. 4. 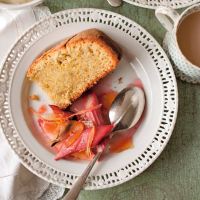 Cut thin slices of the cake and spoon over the rhubarb. Serve with crème fraîche, if liked. This recipe was first published in Sun May 01 15:52:00 BST 2011.